The experimental ads will appear in the platform's professionally produced Shows. If you've recently encountered an ad on Snapchat you can't skip, it's not due to any bug or problem with the app. The company has merely started testing six-second TV commercial-like ads, confirming a previous report about their rollout this month. 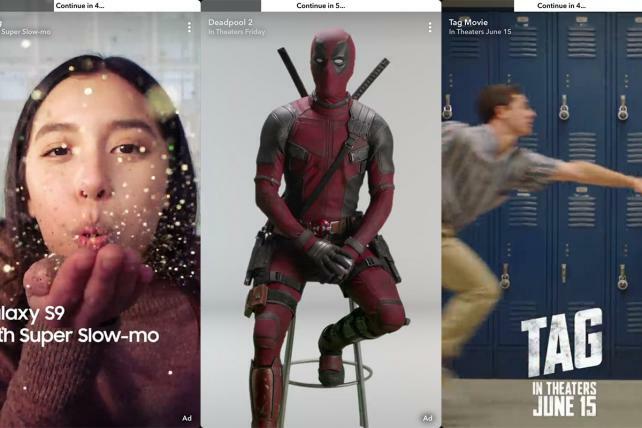 According to AdAge, some of the ephemeral app's first unskippable ads include promos for Deadpool 2 and the Samsung Galaxy S9. They don't show you how much time you have left to watch until you tap on the screen to skip it and -- surprise! -- find out that you can't. The good news is that these ads won't pop up in your friends' posts -- they'll only appear in professionally produced Shows in Snapchat's Discover section by publishing partners like Disney, NBC and MTV-owner Viacom. Snapchat is testing these forced-view ads, because advertisers are reportedly unhappy that the average ad viewing time on the platform is only two seconds. "They can't build a viable ad-supported platform without changing," a digital agency exec told AdAge. While you can't instantly dismiss the experimental ads like you could the other ones on the platform, they're also less robust in a way. Those six seconds are all you get, since they don't link to longer videos or e-commerce experiences. At least the initial batch doesn't -- future ones may find a way to be unskippable and interactive at the same time.